For a larger resolution image of the concept plan, please click here. I am excited to share with the community proposed plans for the area of greenspace surrounding the Stittsville sign located at the southwest corner of Stittsville Main Street and Hazeldean Road. 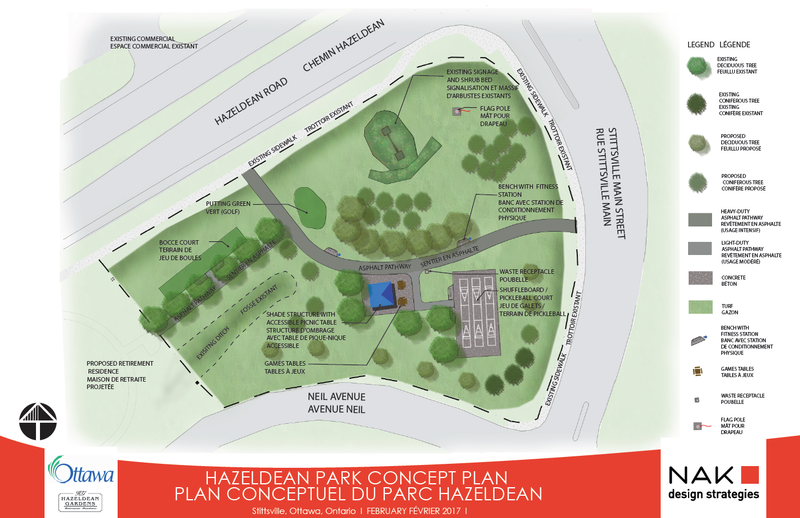 As part of site plan for the Hazeldean Gardens Retirement Residence (application D07-12-15-0201 at 6130 Hazeledean Road), working with my office the applicant has requested to design and construct “older adult” age friendly “park” improvements to the City owned open space lands designated as road allowance located next to their proposed retirement living development. The scope of this project involves the implementation of age-friendly “older adult” site improvements to the existing road allowance located at the corner of Hazeldean Road and Stittsville Main Street. The project will involve all aspects of design and construction from the initial start-up and concept phase (with public consultation), through to detail design, tendering, construction and contract administration carried through to commissioning and eventual take over by the City. Age friendly improvements to the green space road allowance will serve all members of the community and will include amenities suitable for a broad range of age-groups, abilities and interests, and will complement the existing park amenities in the Stittsville park and green space network. The project is being developed in partnership with the developer and funded through the Ward 6 Cash-in-Lieu (CIL) of Parkland fund. Every residential development not providing parkland on their property is required to provide a contribution to this account. The policy outlines that 60% of the contribution is provided to the ward account and 40% is allocated for City wide purposes. I have agreed to provide a reimbursement of up to $114,881.00 from the Ward 6 CIL parkland dedication funds for the design and construction of these improvements. This budget represents 60% of the amount of Cash-In-Lieu of Parkland owing on the adjacent site plan development at 6130 Hazeldean Road ($64,881.00) plus an additional $50,000.00 contributed from the Ward 6 CIL of parkland account. I feel this is an excellent project providing activities geared towards a population that the majority of our parks in Stittsville do not cater to, while also providing different park amenities that may be of interest to all ages. There has already been consultation with some of the seniors in the area and the City is requesting public comments to be provided by March 10, 2017. You can review the concept plan here and please provide your comments to myself at Shad.Qadri@ottawa.ca or 613-580-2476 and the City Planner Jennifer Hemmings at Jennifer.Hemmings@ottawa.ca or 613-580-2424 x20157. I have been contacted by some residents looking for information on the Hazeldean Gardens Retirement Residence and for more information please visit their website www.hazeldeangardens.ca.